Pinnacle is a vodka brand distilled in France and then exported to United States where the flavoring is added. 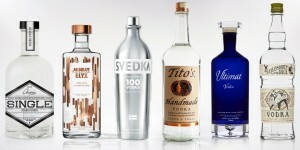 It is a fairly new brand of vodka having been founded in 2002, however, it has over 30 different flavors which should suit just about anyone. Pinnacle vodka is much cheaper than other imported French vodkas, so if you’re tight on the budget, go for Pinnacle and forget the rest. The brand is currently owned by the American manufacturer of spirits Beam Suntory, which also owns other popular brands such as Jim Beam, Maker’s Mark, and Knob Creek. Below are the latest Pinnacle Vodka prices. The following mixed drink recipes call for Pinnacle Vodka, but if you can find any other vodka, it should work just as well. Just remember, if the recipe calls for a certain flavor of vodka, then you should use that flavor. Any other vodka flavor and you pretty much have yourself a completely different drink. Handsome Ginger – 1 part Pinnacle vodka, 2 parts ginger beer, and splash of lime juice. Red Greyhound – 2 parts Pinnacle vodka, 1 part DeKuyper Triple Sec liqueur, and 2 parts Ruby Red grapefruit juice. Club Pinnacle – 1 part Pinnacle vodka, 2 parts club soda, and splash of cranberry juice. Ooh La La Lemon – 1 part Pinnacle Whipped vodka, 2 parts lemonade, and garnish with whipped cream. Cherry on Top – 1 ½ parts Pinnacle Whipped vodka, 1 part Pinnacle Cherry vodka, and ½ part chocolate cherry liqueur. S’Mmmores Latte – 1 part Pinnacle Whipped vodka, 1 part Kamora coffee liqueur, and 2 parts cream. Red N’ Blue Berry Punch – 1 part Pinnacle Red Berry vodka, 1 part DeKuyper Blue Curacao liqueur, and splash of fresh lime juice.